Before Christmas the girls and I were dissecting pigs eyes. It amazed me how much Chiara, my 11 year old, Honi, my 6 year old would enjoy it. Before we started we looked into the different parts of the eyes - I always like to cross reference when I do my research to put it together in a way that my youngest child to my eldest child involved can understand and therefore enjoy but this time my eldest was happy to join in with the research and enjoyed going through book after book and link after link for hours one morning. 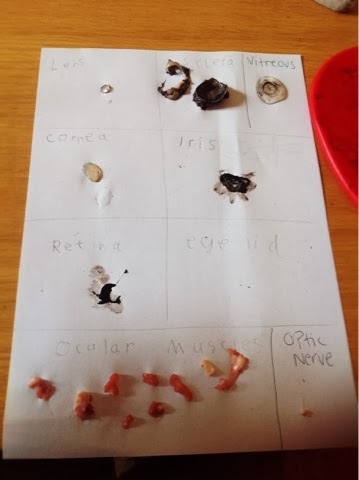 We dissected a pigs eye as it is as close as you can get to what a human eye is like. After you read the rest of this post you could, if you like, see if you can label the different parts on the eye. I will be photocopying the diagram that Naomi finished today, for my girls and setting them the challenge as I think they will find it fun! When we watched our butcher remove the eyes from the pigs head what he was doing was cutting through the ocular muscles. These are the small muscles of the eye that make the eyeball move. The sclera is often called 'the-white-of-the-eye'. It is the tough, opaque tissue that is the eye's protective outer layer. In a young person the sclera has a bluish tint as you get older the tint becomes more of a yellowish colour. The cornea is the transparent layer at the front of the eye. it covers the iris, pupil and the anterior chamber. The Anterior chamber the fluid-filled space inside the eye between the iris and the cornea's innermost surface. The cornea is responsible for about two thirds of the eyes optical power and contributes to most of the eyes focusing power (it is the Lens that tunes the focus). The dilator muscles that dilate (the dilator muscle) - these are what make our pupil widen when in dim or dark lighting. These muscles run round the iris like spokes on the wheel of a push bike. The pupillary sphincter muscles that lies around the very edge of the pupil. In bright light the pupillary sphincter muscles contract causing the pupil to get smaller. These muscles control how much light gets into the eye much like the aperture on a camera. The colour of the iris - The iris gets it's colour from a microscopic pigment called melanin. Everyone's colour, texture and pattern of their iris is as unique as their fingerprint. This is the opening of the centre of the iris. It is a hole, it is not black, the black you are seeing is actually the back of the eye you are seeing. The pupil is the size of the pupil that determines how much light is let in and that is, as you have already read, controlled by the muscles in the iris. The small hole works in the same way as the pinhole camera. If you'd like to make one I have a step by step tutorial on here on here to how to make your own, just click here. The vitreous is the transparent liquid in the anterior chamber. It makes up two thirds of the eyes total volume and is what causes the eye to keep it's shape. If you are dissecting an eye ball before cutting into it, squish it a bit while it's on the table and then leave it again and watch it's shape return. The vitreous in a young eye has a thicker more jelly like texture that an older eye which is thinner and more liquidy. The retina is a multi-layered sensory tissue that lines the back of the eye. The retina contains millions of photo receptors that capture light rays and convert them into electrical impulses that are then sent to the brain where the brain turns them into images. Cones - which work best in bright light and allow us to see in colour. There are about 6 million cones contained in the macula which is the centre of the retina. Rods - Which work best in dim lighting. Rods help us to see at night and are used for peripheral vision. 125 million rods in each eye! The optic nerve transmits the electrical pulses from the retina up your spinal cord nerve to the brain to be turned into images. It connects to the back of the eye near the macula. When dissecting you can see a portion of the optic nerve - The Optic nerve is attached to the sclera at the back of the eye - it will look like a small round white disc which is the optic disc. There are many good 'how to dissect a pig's eye' on YouTube. 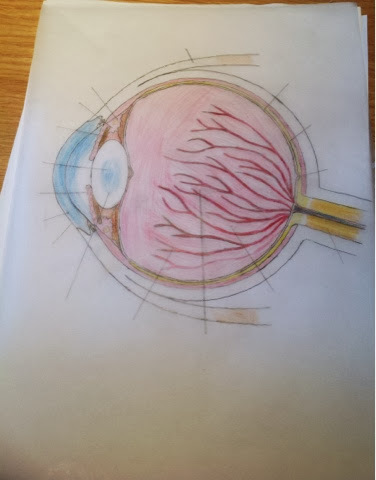 I might make one up next time but I do hope that this helps with understanding more about how the eye works and learning the different parts.